Magician and crossword constructor David Kwong will be putting on a show called “The Enigmatist” next month—part illusions, part puzzles and riddles. It’s in NYC at the High Line Hotel, Friday and Saturday nights in January. Click through to see a teaser video and buy tickets. What is this, Tuesday? I’m not an Erik Agard or an Andy Kravis who is accustomed to polishing off themelesses in under 3 1/2 minutes. I’ve done a number of Ries themelesses, sure, but I wasn’t expecting to zip through. Andrew, by the way, has several lines of puzzles now. 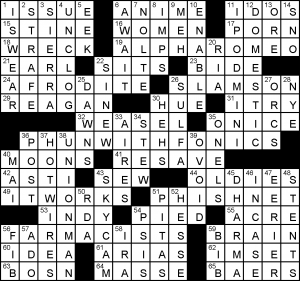 Visit the Aries Puzzles site to check out the options. He’s taking his Rows Garden subscription weekly in 2019 … and also his freestyle/themeless puzzle subscription. Every other week, he’ll have a free cryptic crossword, too. Fave entries: HAIR BOW, TUPPERWARE PARTY (are those still a thing? ), SOCIAL IQ, AIRPORT CODE instead of the usual three-letter airport code in the grid, WAYNE’S WORLD, NED FLANDERS‘s full name, “SO FAR, SO GOOD,” and those stick-on NASAL STRIPS I’ve never tried. I dunno, man. This just doesn’t look like cow poop to me. 42a. [Like cinnamon trees], ASIAN. What an interesting clue angle. 43a. [Family name of classic TV], RICARDO. When the old reruns on Nick at Nite are Friends, is it time to redefine “classic TV” well beyond the ’50s and ’60s? Not all the fill is “hooray!” Some of it is “meh.” Like LOY SPRIT ETAS REPRO SOT SHA LEA. But it didn’t slow me down, and Friday solvers can typically knock these off just fine. Four stars from me. That’s an average of over 1 star per minute spent! An uncommonly high ratio for a themeless puzzle. I zipped through this one! Cute concept and not-too-challenging in the Fill Department, though I got a nice workout for my brain, as befits the title. Four kinds of BARS, placed parallel in the puzzle: the SPACE BAR on your keyboard, a SALAD BAR for lunch, a DIVE BAR for whenever it’s 5 o’clock somewhere, and a GOLD BAR that you can mail to my home address, thank you. I sure went to plenty of DIVE BARS in my SALAD DAYS; and Spaceballs — pure COMEDY GOLD! [48a: Commoners, collectively]: HOI POLLOI. For the longest time, because this phrase is in another language (Greek), and because I’d only heard it said by, say, monocled aristocrats in old movies from the 1930s, I thought it meant the elite. [69a: Feminist media critic Sarkeesian]: ANITA. She was targeted, harassed, and doxed for her work on the representation of women and female characters in video games — by the same troll factory that was responsible for #Gamergate. Why are people like that? Why are assholes? [6d: “Becoming” memoirist Michelle]: OBAMA. Nice to see Michelle get some clue love. Did you hear about the eight-year-old girl who dressed as Michelle Obama for her school’s “heroes day”? Adorbs and inspiring. 19a [Paramount paramour?] ALPHA ROMEO. 24a [Greek goddess carrying a pick?] AFRODITE. 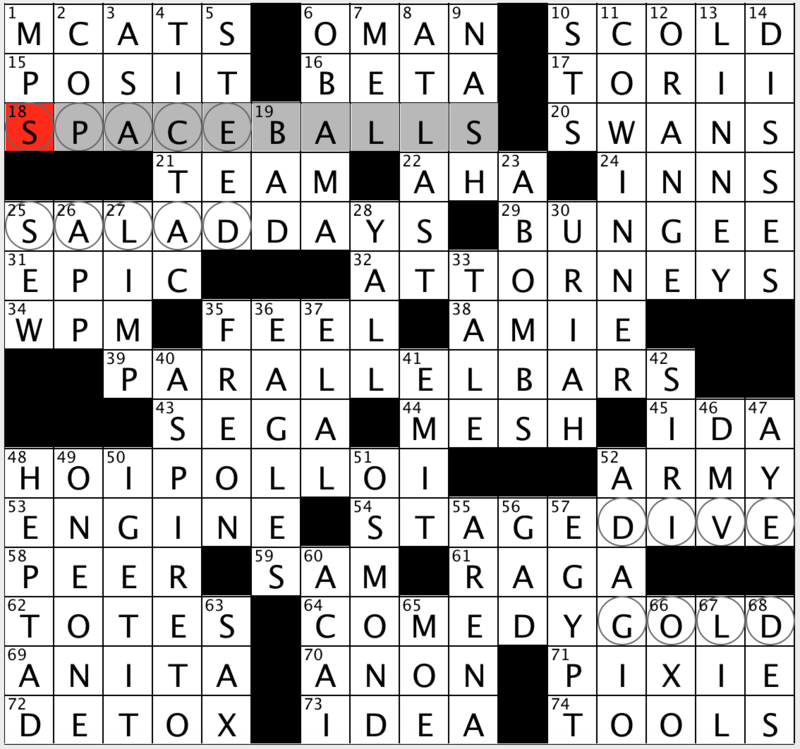 36a [Program for young readers, and a hint to five puzzle answers] PHUN WITH FONICS. 51a [Online scammer’s tool?] PHISH NET. 56a [Dispensers of horse pills?] FARMACISTS. 26a [Applies with force, as brakes] SLAMS ON. 11d [Early Apple audio player] IPOD MINI. 37 [Starts without a key] HOT-WIRES. 38d [True-blue teamster, say] UNION MAN. That’s about it, folks. Very capably constructed, as smooth as it needs to be. Clued cleverly but not audaciously so. Nice, but nothing thrilling or exciting. 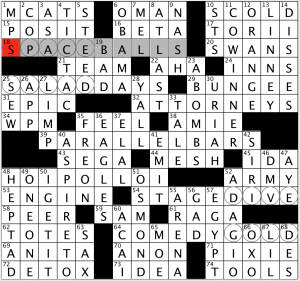 And, for me to finish a Friday in under 15 minutes–well, it’s become clear to me that the L.A. Times “wants” to be solvable by average solvers. 2.5 stars. This entry was posted in Daily Puzzles and tagged Andrew J. Ries, Dani Landman, Daniel Landman, Ed Sessa. Bookmark the permalink. I thought that NASAR STRIPS might be those rough, noisy strips on the edge of the highway to discourage a driver from veering off the road, but it occurred to me that on a bridge, those would be more likely to cause, rather than prevent, congestion. Does anyone out there know what those are called? 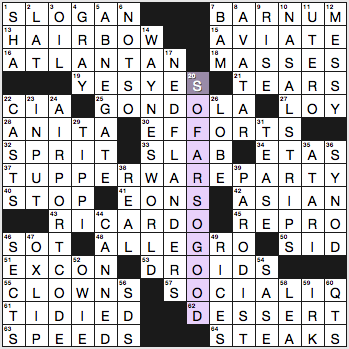 This was a very enjoyable Friday puzzle, just right in terms of difficulty and smiles. Thanks! Lise, the strips you’re asking about are rumble strips. And Wikipedia tells me they’re “also known as sleeper lines, alert strips, audible lines, sleepy bumps, wake up calls, growlers, drift lines, and drunk bumps.” I know them as rumble strips, but I’m digging some of the more colorful names. Your LOY / ROY mix-up was probably a clever trap by Andy due to the similarities in the names Ziegfeld and Siegfried. I fell for it, too, until I read the date in the clue. That sign would definitely give me a start. If I ever visit the U.K., I will look out for the Cat’s Eyes. Thanks! Thanks to all of you for all of those cool and colorful terms! and my first entry was FOY… right for the period, but not for the co-star-in-question. 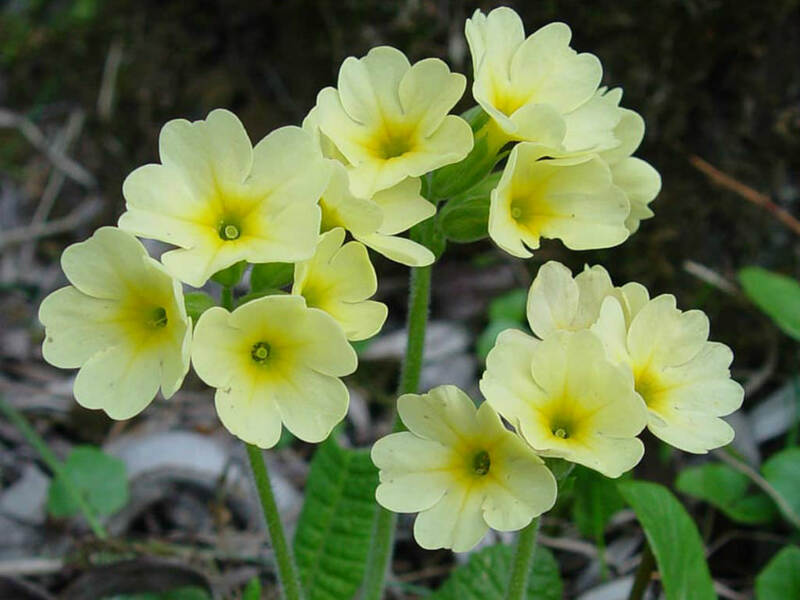 what a neat etymology for OXLIP Amy! I wonder if “slip” comes from the same origin. After all, as anyone who’s ever stepped in a pile of poop in a field knows, that stuff is slippery! According to Wikipedia, both oxlip and the more common cowslip are so named because they tend to grow in boggy parts of cow pastures. I was thinking perhaps that cows liked to eat them, so the seeds would be distributed via the bovine digestive system and the flowers would spring up in cow poop. I’ll take Rumble Strips Tittypines, FTW. I’ll be Sleepy Palsywort. I also like Plumrocks, the one-named elf. Came here to get confirmation that the NYT was easy and that I am not actually getting smarter. Was not disappointed. AFRODITE for the hilarious win! Hey, you guys posted before the review was even up! Thank you Judge for filling in. Not exactly work, but not enough time between work and office party to get blog done, and too tired after.